On a steamy wet Thursday morning at the end of July I threw my kayak into the back of my pickup and brought it down to Island Creek Park, which is on the Hudson River waterfront next to the Port of Albany. Not something I do too often in the middle of the week, but this was a special occasion, the Floating Island Release Party. Since I take a keen interest in the spillage of raw sewage into the Hudson River along the South End I had to be sure to be there. And I even got to help out a little bit. Rain had been falling earlier that morning like it had been all week but it didn’t look like the event was going to be cancelled. 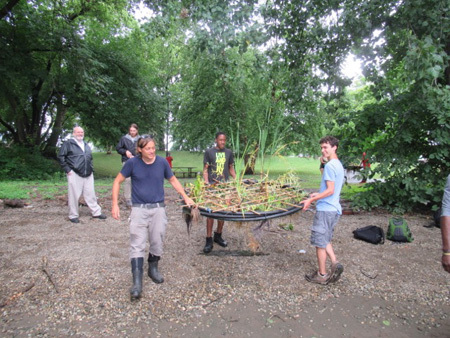 Scott Kellog of the Radix Center, the South End’s innovative urban farm, is not the sort to let a little rain upend his plans, or in this case a sky that looked like it would open up and drown us any second. As it turned out the rain held off until the end of the event, after the Floating Island had been released into the river and functioning to his satisfaction. Mr. Kellog and his partner Stacy Pettigrew began the Radix Ecological Sustainability Center in 2009 on several adjacent empty lots covered with decaying asphalt, located on the other side of Lincoln Park from my house. Since then they have built an impressive two story almost fossil fuel free greenhouse for year round cultivation, laid out an array of above ground garden plots that yield a surplus of vegetables each year, and maintain a pen full of farm animals that all have names so you know they get treated well and don’t get eaten. The Radix farm has built mutually beneficial relationships with the City government and with various City agencies, with the local public schools, with nearby colleges and universities, with various local businesses, and of course with the surrounding neighborhoods of the South End. Their purpose according to their website “is to promote ecological literacy and environmental stewardship through educational programs based around demonstrations of sustainable technologies.” I would add that the Radix farm is an excellent example of an economic driver built by hard work and innovation, of finding an unnoticed niche and using it to fill a community need. 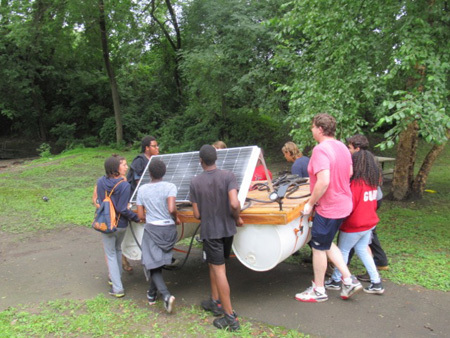 I arrived at Island Creek Park about 9:30AM a half hour before the scheduled launch of the Floating Island to find that the participants in the project, the majority of them young students, were already there along with most of the device. The last pieces arrived by pickup truck just as I did and they were carefully lifted out of the bed and laid on the grass next to the other pieces. It was a strange and wonderful collection of objects. Fortunately a young lady named Justina was announcing that she was there to explain how the Island worked for anyone who was interested, so I interviewed her. A chemistry major at Rensselaer Polytechnic Institute, she had actually worked on the design of the Island during her last semester. 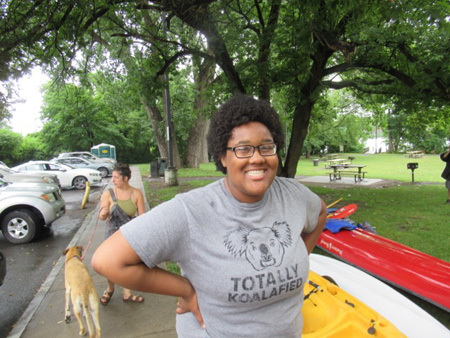 Now as part of the City of Albany Summer Youth Program she split her time this summer between working on this project and teaching others in the program. That last bit was very interesting to me. A little later former Common Council member Dominick Calsolaro, who had come to watch, told me that this sort of active educational partnership had become the norm in the City Youth Program after Kathy Sheehan became mayor in 2015. 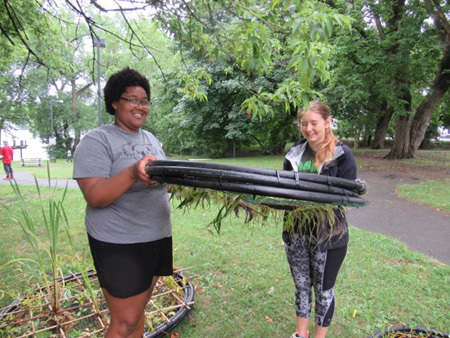 Many of us remember all too well how the summer youth program operated under her predecessors, groups of kids being paid to roam around the City parks and pick up litter, but mostly goofing off instead of diligently carrying out their busywork. This now seems a much better use of my tax dollars, assigning young people to help and learn with the urban farm. Phytoremediation (from Ancient Greek meaning 'restoring balance') refers to the technologies that use living plants to clean up soil, air, and water contaminated with hazardous contaminants. It is defined as "the use of green plants and the associated microorganisms... to either contain, remove or render toxic environmental contaminants harmless". 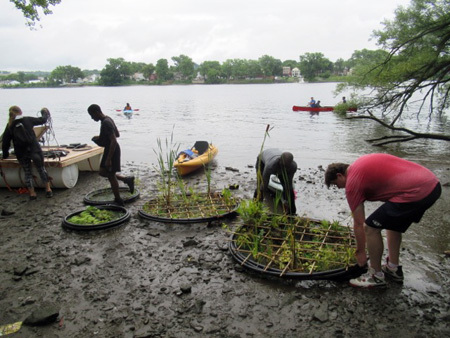 Basically, the Floating Island is a device that supports a collection of plants along with their attendant microorganisms that clean the river water of sewage residue and toxic substances. 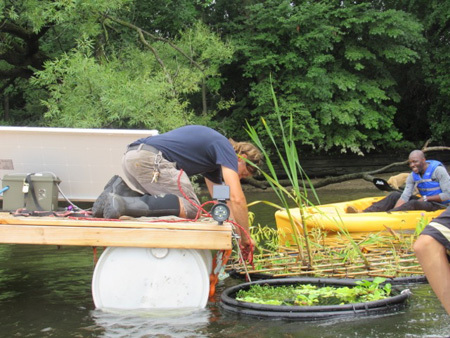 The plants reside next to the main platform on four “baby islands,” platforms of wide mesh surrounded by three rounds of heavy duty garden hose for floatation. 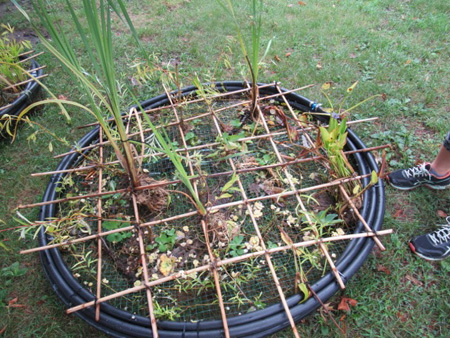 The roots of the plants dangle through the mesh into the water, sucking up dissolved sewage (which is nutritious to plants) along with whatever nasty chemicals or metals that are suspended in the water. Justina knew the mechanics of the device well but was not too familiar with the plants, so in answer to my inquiry she called over Rosa, who is attending Williams College and is a summer intern at Radix. She named the following plants wound in spirals on the mesh: cattails, water lettuce, water cress, water hyacinth, papyrus (which she believed was a native American variety) arrowhead and of course willow bush. There might be more that she missed but this is quite a variety. The undersides of the plants and especially the microorganisms that cluster around the roots eat up a lot of oxygen, so there is a problem of creating a sort of “dead zone” under the baby islands, which would limit the efficiency of the system. Thus a “burbler” (as Mr. Kellog calls them) is dangled in the water underneath each pair of baby islands, feeding air to the plants and microorganisms to encourage them to grow. 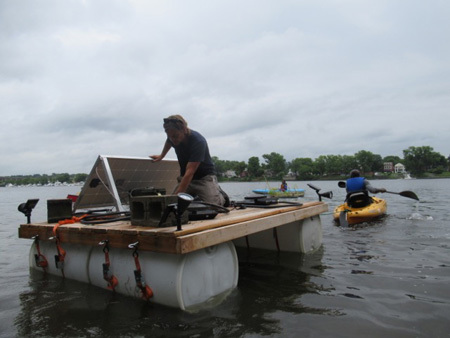 The burblers are fed by an air pump up on the deck, which is powered by the solar panels. The deck is made of cedar, which does not decay quickly in water like ordinary wood does. Using treated lumber would be self defeating because it leaches harmful chemicals into the water, usually copper sulfate which is used to kill roots in sewer lines. I asked Mr. Kellog is he had considered lumber made from recycled plastic which takes even longer to decay in water. He had, but cedar is much lighter and, he told me, more aesthetically pleasing. Finally, on each of the four corners of the deck are bolted self-contained lights that have solar charged batteries so the Island is visible to watercraft at night. 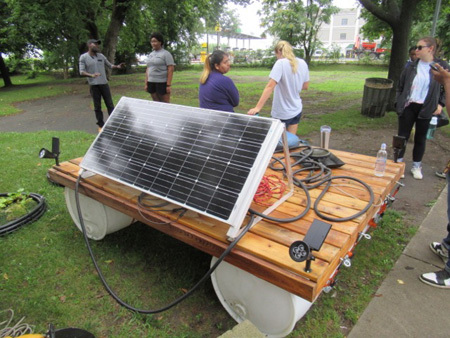 The water pump solar array does not have batteries, Mr. Kellog explained that installing the large batteries needed for that system would drive up costs and would require too much maintenance. Thus the burblers don’t work at night, but that shouldn’t make much of an overall difference to the efficiency of the system. The reason the Island was launched here is a story in itself. 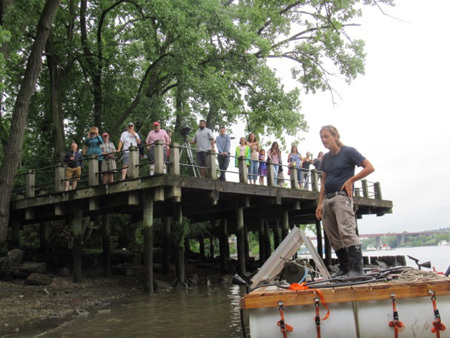 The financing for this project comes from a $5000 grant from the City of Albany Water Department, indeed deputy water commissioner Bill Simcoe was present among the 50 or so interested spectators to the launching of the Island. Now, you might very well ask, why would the Water Department do such a thing? Why is this project of interest to them and why would the City endorse it? A short ways up the river from Island Creek Park is the Big C Pipe, about which I have written extensively. It is the mouth of the Beaverkill River which is buried underground, and serves as the outflow for Washington Park Lake. In addition the buried river collects some 70% of the street runoff in the City of Albany. Unfortunately, that street runoff collection system is connected at several points to the regular sewage pipes in downtown Albany, a setup that goes back more than a century that is known as Combined Sewage Overflow, or CSO. The idea is that if there is a flash flood that overwhelms the storm drains, then the sewage pipes will pick up the extra water at these connection points and discharge that extra water into the Hudson River instead of forming big lakes on the streets. That’s the theory. Often what happens is vice versa, too much water in the sewer pipes can slop into the storm drain pipes and into the Beaverkill and out the Big C.
You might note a problem with this CSO system as far as the water quality of the Hudson River. For over a century neither the City nor the State paid the slightest bit of attention to the raw sewage pouring out of the Big C into the river, which no one who was considered important ever deigned to notice. That is, until a certain loud mouthed obnoxious blogger starting making sure that everybody knew about this problem. About six years ago the State finally acknowledged the existence of the Big C Pipe and started monitoring the regular raw sewage discharges into the Hudson that were at their most massive after big storms. After 2013 the State imposed strict reporting protocols for these kinds of big sewage discharges. And they weren’t kidding, they want these spills reported promptly, particularly if the discharges come out of a sewage treatment plant. Well, a little over a year ago at the end of June 2017, a series of big storms forced the sewage treatment plant just downstream from Island Creek Park to discharge out of the Big C Pipe an estimated total of four million gallons of sewage over the course of a week. The problem, you see, was not the discharge itself, but that the City water department failed to promptly report the discharges to the Department of Environmental Conservation (DEC.) The City was facing fines of up to $37,500 a day, imposed entirely at the discretion of the DEC. The City water department scrambled to change internal procedures to ensure such spills will be reported within the required timeframe of two hours. But since the DEC is not really interested in generating revenue by fining municipalities which receive State aid anyway (which would be self defeating) it was open to negotiation about fines due. 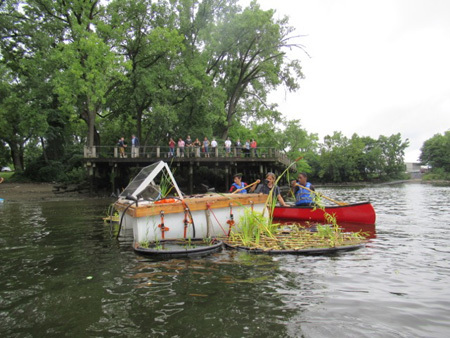 So instead of paying a massive fine, the water department contributed $5000 to the Radix Center to build and launch this Floating Island, which will help clean up the lesser sewage discharges that regularly dribble out of the Big C just upstream. The DEC, reportedly, is satisfied. Scott Kellogg, as is usual for him, had this project well organized. At the same time he is a natural teacher. He made sure that all the kids present got a chance to participate, not just the self-starting college kids but also the high schoolers that tended to stand back, everybody working together under his direction. That has always been his mission, to create sustainable life sustaining technologies and to pass this knowledge onto the young folks who need these things to survive the scary future in front of us. Oh, and he had invaluable assistance from his big dog, who eventually violated several City ordinances by getting off the leash. He swam around happily in the water watching the proceedings with a puzzled look. The pup had plenty of energy, I noted that he chewed about two feet worth of bark off a ten inch thick downed branch that was half in the water. I suppose the dog needed some fido-remediation but he didn’t really bother anybody and seemed mighty happy. 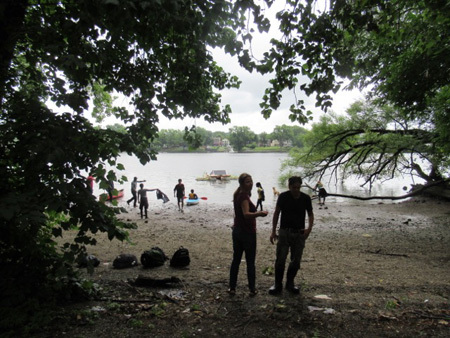 The pieces of the Island were brought down from the parking lot to the water’s edge by the volunteers and interns. The spectators stood watching where the mud flats ended (the tide was going out, revealing more mud flats) or they lined the fishing deck above. Two local TV stations filmed the event and one newspaper was present. The first order of business was to push the deck out into the water. After it got shoved out a little ways, Mr. Kellogg stood on the deck as it sat in the mud and gave a brief speech to the assembled multitude, which merited spirited applause. Next a fellow named Jay piloting a yellow kayak was assigned to tow the platform to the designated spot. But Jay had trouble orienting the bulky load by himself, so Mr. Kellogg asked me to paddle up and help steer the thing to the preferred spot, oh boy I got to help. 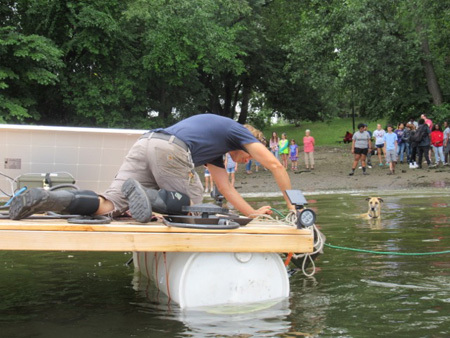 We brought the platform to a spot where the water was about 15 feet deep, and Mr. Kellogg dropped a couple of cinder blocks tied with a rope off opposite sides as anchors. Later when we were admiring the thing from shore he pointed out that the solar panels were oriented wrong, they needed to point downriver toward the south facing the sun. It was good that he was using cellular solar panels, they still generate electrons if they are partially shaded or not receiving direct sunlight. Even on this overcast day they were powering the air pump just fine. The kids in the other kayaks towed the much lighter baby islands out to sea and waited for Mr. Kellogg to call to bring them to the platform. He dropped the burblers into the water and set the baby islands full of plants over them, tying them firmly to the platform. A few adjustments here and there and he was satisfied with his work. He slid precariously into one of the kayaks and headed for shore. So the idea is to leave the thing out there in the water and let the plants clean. Mr. Kellogg expects there will be adjustments to be made to the device as problems arise, this is after all an experimental project, a unique device unlike anything else. If all goes well it will sit there until it needs to be towed in when the weather gets cold in October and it will be brought out into the water again when the weather gets warm again, perhaps as early as April. One of the likely problems is the waves generated by passing speed boats. Although the Hudson around here is tidal it is pretty predictable, but when boat waves reach the shallow areas near shore where the Island is anchored they can become large and cause capsizing. Definitely the platform will need more and heavier anchors to keep it in place and orient the solar panels toward the sun, I don’t think a couple of cinder blocks will be enough. Someone pointed out that fishermen casting off the nearby deck may snag their lines on the Island. There is also a small possibility of vandalism, I’ve never seen anyone go swimming in the river here or anyplace nearby, but the Island might look attractive to some drunken jerk one night. And how well will it hold up to thunderstorms, and how about birds and other wildlife using the deck for a home or the plants for food. On the other hand, phytoremediation is very successfully used elsewhere for wastewater treatment. The usual method is to cultivate crops such as willow bush or bamboo by feeding them municipal wastewater, the idea being that the plants draw the nutrients out of the water and can be used as fodder or as biofuel. Instead of dumping wastewater or landfill leachate into rivers or letting it seep into groundwater, a low lying area is turned into wetlands with the wastewater and is used to either grow a useful crop or create a wild habitat, while at the same time removing toxins and disease causing organisms from the water. As far as I can tell, the design of this Floating Island is unique, an innovation. 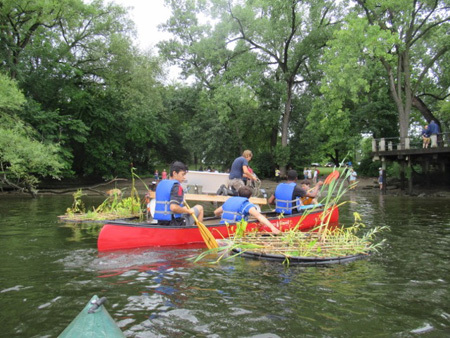 There are floating islands in the Chicago River in Illinois, long structures that use a kind of jumbo sized pegboard to hold the plants while their roots dangle in the water. Justina told me they even use robots to remove floating garbage and kill mosquito larvae. Another method uses a “matrix” which looks like big kitchen scrub pads to firmly hold the plants in place. 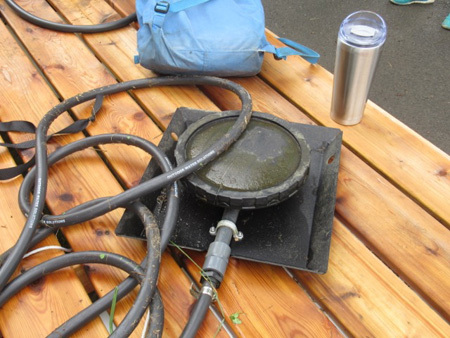 These are often used in sewage treatment plants and for floating breakwaters. There are several companies out there that provide the materials, set up these kinds of islands and maintain them. 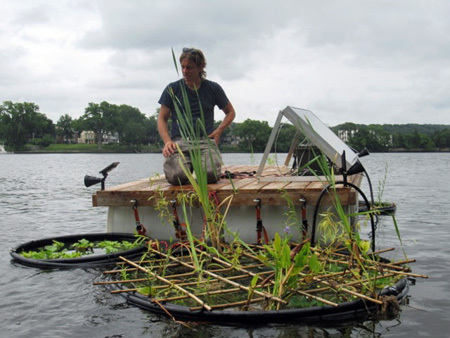 The one big thing I don’t see mentioned in all these other floating island systems is the underwater aerators, the “burblers.” The pumping of air under the plants recognizes the importance of cultivating the right kind of microorganisms needed for efficient cleaning of the water and of the health of the plants. So it seems that we are witness to the beginnings of an entirely new technology, a compact and efficient way to purify water, science and technology in action. 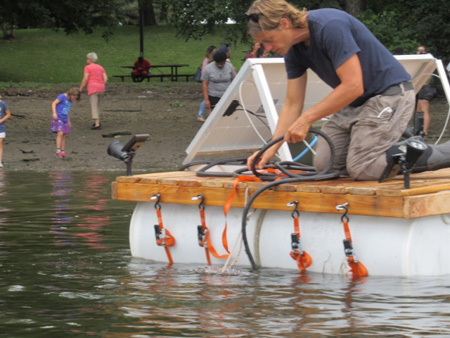 By itself this little device is not expected to make a massive difference in water quality off Island Creek Park, but we may very well be in for a surprise. If all goes well Scott Kellogg sees more of these devices being built and installed on the Albany waterfront next year. I certainly hope that someone involved with this project is looking at patents or copyrights because this Island or something very much like it may very well become the standard phytoremediation device for the rest of the 21st Century. Oh, and while I was chatting with Mr. Kellogg, the two of us standing at the edge of the mud flats admiring the Island, the sky did indeed open up and pour. It rained like a mother as I hauled my kayak up the steep hill and threw it into the back of my truck and frantically got into the cab. I didn’t even bother to tie down the boat but I didn’t have far to go.